The iron and steel sector is the largest industrial energy consumer and largest emission source of greenhouse gases (GHGs) and primary air pollutants. With the growing concern over climate change, steel makers are faced with the challenge of finding ways of lowering CO2 emissions without seriously undermining process efficiency or considerably adding to costs. Steel is central to Ghana’s current infrastructure, housing, manufacturing, agriculture, water and energy supply hence the backbone of economic development. As an emerging economy whose population continues to increase, the demand for steel in the next decade will also increase leading to the use of more fossil fuel and emissions of GHGs and primary air pollutants. In order to minimize these impacts and to deliver a manufacturing strategy based around “low emission”, iron and steel industries in Ghana need to adopt a number of innovative and new technological measures that is cost-effective and has the potential to reduce emissions of GHG and unintentionally produced primary air pollutants. In the following research, assessment of the most cost effectiveness of different measures that will reduce the emission of CO2 and primary air pollutants in iron and steel industries was conducted. This was conducted by: estimating the annual CO2 reduction capacity of each measure; estimation of the total operational costs or investment for each pollution abatement measure and calculating and ranking of possible pollution abatement measures based on their cost-effectiveness ($ per year reduced kg CO2). The result was used to construct marginal abatement cost curves (MACCs). Near net shape casting thin slab was the most cost effective alternative climate and air pollution abatement measure. For the assessment of the current cost effective CO2 abatement measures, IMF was found to be the most cost-effective production route compared to EAF. Hence, the implementation of these measures will be critical to reach the environmental objectives of low emission iron and steel production. A comparative assessment of the two major iron and steelmaking route available in Ghana namely electric arc furnace (EAF) and induction melting furnace (IMF) was conducted against a selection of energy consumption and emission (CO2 eq and priority air pollutants) indicators. The results showed that, EAF has higher energy consumption requirements and emissions than the IMF route. Thus EAF production route has the most significant low emission reduction challenges. 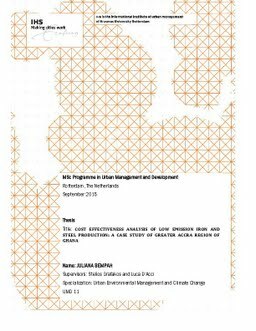 The study also incorporates investigation of barriers that account for the adoption and implementation of low emission measures in Ghanaian iron and steel industries. Results from the barriers interviews revealed that, “lack of budget funding”, “access to capital/investment”, “high cost of energy”, “cost of raw materials and production”, “inefficient technology” and “lack of technical skills” are considered to be of high importance. This result provides a good insight for future industrial policies towards low emission manufacturing. The study recommends further studies into energy efficiency measures, which is among one of the most cost-effective investments that the iron and steel industries could make in improving efficiency and productivity, and reducing CO2 and local air pollutant emissions. Again further studies into the barriers for adoption and implementation of low emission measures should incorporate views of external stakeholders to give a more comprehensive view of the subject studied and facilitates broad base knowledge suitable for policy implementation. Thesis Advisor Grafakos, S., D’Acci, L.